The tire pressure alert on my car was screaming at me about both my front tires. They were at 27psi when they should have been at 35psi. After a short drive where I willed them re-inflate, I decided I better not risk it and headed to a nearby 7-11 that I hoped would have a working air machine. As luck would have it, not only was the machine functional, but it was an upgraded version of most compressors in that you could dial in your desired tire pressure. And as an additional bonus, the machine took a credit card, which saved me a trip to the counter to get quarters. Before starting up the machine I had one last task to do: remove the valve caps on all four tires. I figured better to get this out of the way first, then fumble with them while the timer on the air is counting down. I go to unscrew the first valve cap. It's stuck. I try harder. No luck. I try one in back. It's sticky, but I manage to get it. I try the other side in back, and while sticky, I can get it off. The front two wheels however are far more stubborn. Curse my pitiful finger strength! Of all the crap valuable tools I carry, one thing I don't have on me is a pliers. So applying brute force that way was out of the question. Surely I wouldn't have to resign myself to defeat all because of a couple of frozen valve caps? Then I had an idea. One item I do keep in my bag is a SWAT-T tourniquet which is nothing bug a glorified piece of elastic band. I wondered: what if used the rubbery surface of the SWAT-T to give me extra grip on the value cap. Would that give me the advantage I need to get the job done? And what do you know, it worked. I got the valve caps off, filled up my tires and didn't have to make an extra trip back home. Victory was mine! So along with being a tourniquet, pressure bandage and water balloon launcher, you can also jar/nob removal assistance tool to the SWAT-T feature set. Who knew? 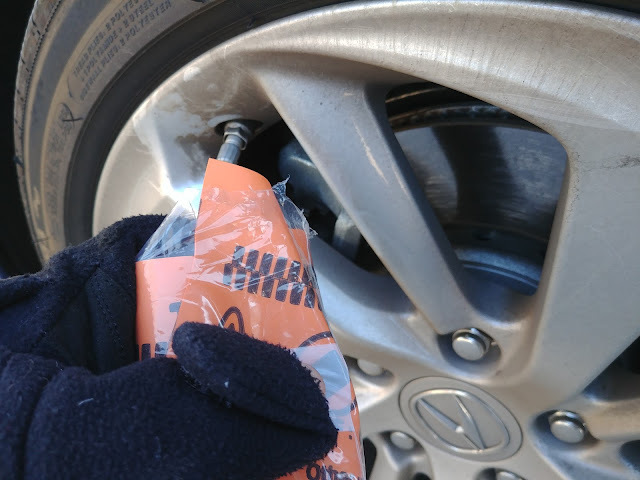 Update: Thanks to my Dad who reminded me that my low tire pressure is most likely due to the especially frigid temps around here, and when it warms up, I'm going to end up needing to bleed off some air. Still, discussions like this one make me feel like less of an idiot, considering that low air pressure is more likely to cause problems (including hydroplaning).